When you tend to the garden you don’t seek to control it; take the same approach with your body & menstrual cycle. Tend to your body tenderly, without trying to control it. 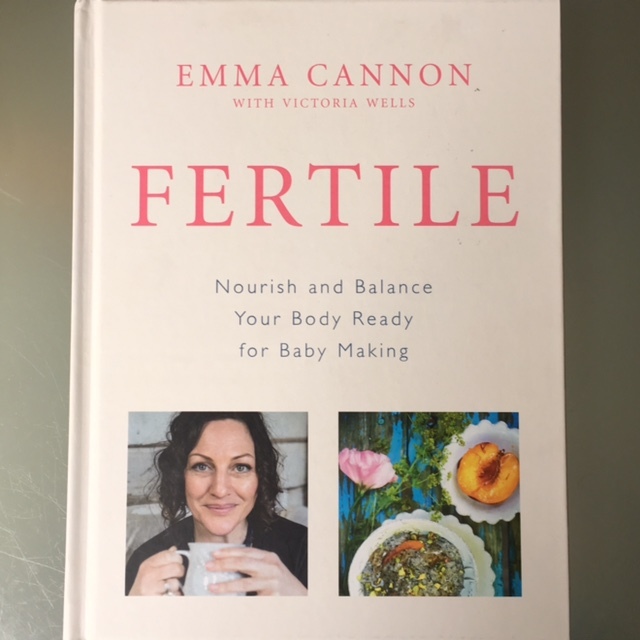 There are five ingredients that in Emma’s opinion are invaluable to fertile life: flexibility, creativity, nourishment, transformation & belief. Armed with them you can achieve so much more on your life’s journey, both personally & professionally, but in our constant race for deadlines, we tend to forget to nurture our inner sanctum, which negatively impacts our life overall. From how to maintain a healthy weight to thoughts on general exercise & why Emma is not a huge fan of running herself, from alcohol consumption to dealing with stress, Emma gives not popular, but sensible advice that works. She also helpfully points out that most couples aren’t infertile, but sub fertile, so improving diet & lifestyle consciously can help improve your chances of conceiving a much longed for baby when you are ready to. In the book Emma also touches on the subject of detox & cleanse, but not in a way that we came to view it due to press coverage. Emma’s Fertile Cleanse should be viewed as a diet cleanse, rather than a detox, but it isn’t just about what you eat. Emma also talks about rituals that might seem simple, yet have been proven to work no less effectively than modern scientific advances – we all are constantly tempted by new beauty & wellbeing launches, yet things like oil pulling, acupuncture, abdominal massage, as well as ‘fish & chips bath’ – and no, it has nothing to do with eating them while having a relaxing bath, – prove that some ‘tried & tested concepts’ are here to stay, untouched by passage of time. When it comes to recipes, you have chapters dedicated to breakfasts, soups, condiments, fish/meat & poultry, vegetable dishes & salads & sweet treats & drinks. Emma loves food & cooking, so each recipe, appealing to vegetarians, as well as carnivores, was created in Emma’s London kitchen, as well as in France, alongside an experienced & sensible nutritionist Victoria Wells. Interestingly enough, both food & advice in this book are built on the unique alchemy of ancient Eastern & traditional Western medical principles, thus appealing & applying to very different women. In order to feel well, you need to eat well, enjoying textures, flavours & colours of your food, sitting at the table & chewing, not just swallowing your food mindlessly. Delicious food can be savoured on your own, offering a break from commitments & routine, or in the company of your loved ones, off the social media grid, when conversation flows 7 there is no tie in the background, diverting your attention. Irrespective of your own dietary preferences, each recipe starts tempting your eyes with simple visuals, when you are leafing through the book. My favourites are Amaranth, spiced pear & pumpkin seed porridge, as well as Mixed Grain Porridge with blackberries, hazelnuts & flaxseeds, but Black sesame porridge with roasted saffron peaches is as exotic, as it is nurturing – I just wish someone brought it to me in the morning to bed. Well, maybe when I am older & school runs will be things of the past….Or maybe your taste buds will be tempted by the sweet flavour of the Chestnut Compote? Lunch calls for Celeriac & Chestnut Soup with Chestnut & Herb Pesto, but I also like to make myself some pasta with variations of pesto, like Chestnut & Herb – easy, fragrant & nurturing. Or maybe you will be enticed by sourdough bread smothered with Chickpea & Date Hummus? With the recent gloomy weather akin to autumn rather than spring, while reading this book I was drawn to the comfort of Moroccan-spiced Chicken Livers or Pork & Chicken Liver Meatballs with Creamy Polenta – ultimate comfort food. Almond-crusted Salmon with Cauliflower Puree got thumbs up from my girlfriends for dinner, as will Sweet Potato & Chickpea Gnocchi. Another appealing thing when it comes to this books recipes is their practicality. Take energy balls, for example – easy to make, then store in a jar in the fridge (not they they last for long in my household!) or & taken to the office & eaten as healthy snack (I favour Spiced date & almond cannon-balls for a brain kick). Cooking is a form of self-love, a ritual that was practised by many generations of women before us – this book so wonderfully reminds us of that! I was intrigued by Avocado Kefir Lassi, which when I made it, reminded me of one drunk at the spa in the Maldives a few years ago. I also tried making Beet Kvas, which is nice, but I prefer wheat one when I am in Moscow – some old habits are too dear to be changed, as traditional taste reminds me of my childhood. In essence, this book is for any woman who wants to look after her female power force. Whether we are girly or boyish by personality, our nurturing nature can’t be bypassed & deserves to be looked after. I think women in their 20s might be inspired by knowledge & recipes that won’t be too taxing on their time, as will older women, who have, want to or don’t want to have kids. I have two children & don’t plan to add to my brood, but my femininity is no less important to me now, as it was in my youth because I want not just to look good, but feel good as well. This book offers you wisdom when you feel like expanding your knowledge, whether you read it or skim through pages & try a recipe or two. At your own pace, listening to your own inner voice & getting what you need from the book when you need it. It’s like a wise & light-footed friend who has your best interest at heart but never preaches or forces things on you.